LAS VEGAS -- The CES show is feeling more and more like a car show. The first press conference of the event was for Faraday Future, a company showing off a next-generation concept electric car, and Volkswagen took the stage Tuesday evening to officially kick off CES and show off an electric car of its own, a concept of its all-electric version of its iconic VW bus. We had the opportunity to briefly drive a prototype of the vehicle at CES, and walked away very impressed. It is compact, making it a great fit for city drivers, but also has enough room inside (and trunk space) that you don’t feel like you’re tooling around in a clown car. Features include a 10.2-inch color touchscreen display; a rear camera mirror, which provides a wide-angle view of what’s happening behind the vehicle; and surround vision, a technology that allows drivers to see a bird’s eye view of the environment around the vehicle. That view can be super useful for those trying to squeeze into that tight parallel parking space and need to know how close they're getting to the curb. Each one of those features has a little something that makes it standout from some of the other options out there. For instance, the touchscreen can be customized with widgets that you want access to – be it energy stats, Pandora radio or what have you. And the rear cam is actually displayed on the rearview mirror rather than the center console, making it easier to see while you have the car in reverse. Bluetooth low energy will allow the car to get to know individual drivers of the vehicle, and make adjustments to their specifications as they approach the vehicle. For instance, if you’re 6’ 2”, the car might recognize you’re approaching and automatically adjust the seat to fit your height after your shorter spouse finishes driving. The feature can also do things like set a specific temperature and adjust other features. That gamification details is an interesting one. 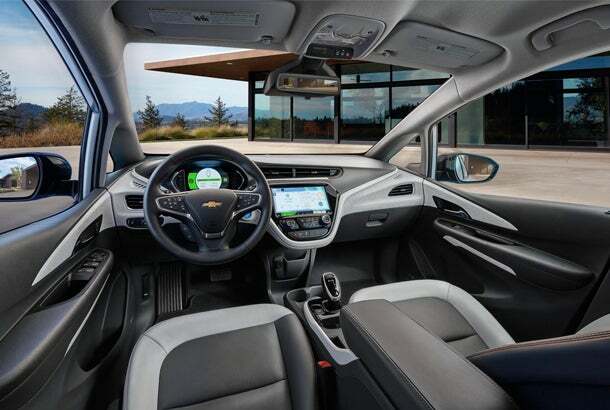 Chevy will ultimately be offering Bolt EV owners the opportunity to compete with other owners, to compare driving styles and determine who among the group is driving the most efficiently. With a 200-mile range and innovative features, it’s definitely a game changer in the world of electric cars.